"The happy Union of these States is a wonder; their Constitution a miracle; their example the hope of Liberty throughout the world." Reading primary sources is hard for ELLs whose language skills are not at an advanced level of proficiency. Teaching about the Declaration of Independence and the Constitution, and describing the causes, battles, other events, and results of the Revolutionary War can also be difficult because many ELLs don’t have the background knowledge necessary for understanding this seminal period of American history. 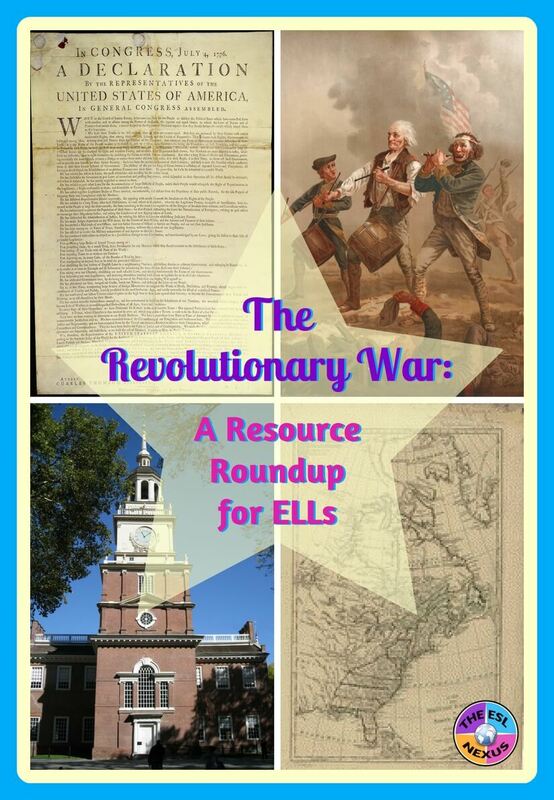 So although most U.S. schools are now on vacation, in keeping with the spirit of my past 2 blog posts of book recommendations, today I’m going to do a resource round up of materials that I’ve found helpful to use with ELLs when teaching about the War for Independence, as well as a few other sources of information I've found personally interesting. Links are embedded in the green text so just click on them for more info about the resources. I used the 2nd edition, which was paperback; now there is a newer hardcover version. I really liked this book because it used the CALLA approach -- the student tasks mixed language learning with strategies for how to learn academic content. There is a separate teacher’s book which I didn’t use much because it was pretty easy to figure out how to use the student book. The hardcover book is expensive so unless you’re desperate, I’d ask your school to buy it instead of paying out of pocket yourself. Two chapters, called The War for Independence and A Nation Begins, use simplified language and describe in very general terms what the war was about and its aftermath. There are a lot of language-focused exercises so this is a good choice for ELLs at low intermediate levels of proficiency. A 26-page book with text that intermediate proficiency level ELLs should be able to comprehend; includes 4 pages of activities at the end plus a 2-page glossary (words are also glossed in the text itself). As can be expected with a National Geographic publication, there are loads of pictures; in fact, the content is about half text and half images. Good for independent reading and doing research. Lots of short reading passages with comprehension questions and some activities. Also includes a timeline from 1733 – 1783 detailing causes and events of the war up to the signing of the Treaty of Paris. Good for activities to supplement your teaching. 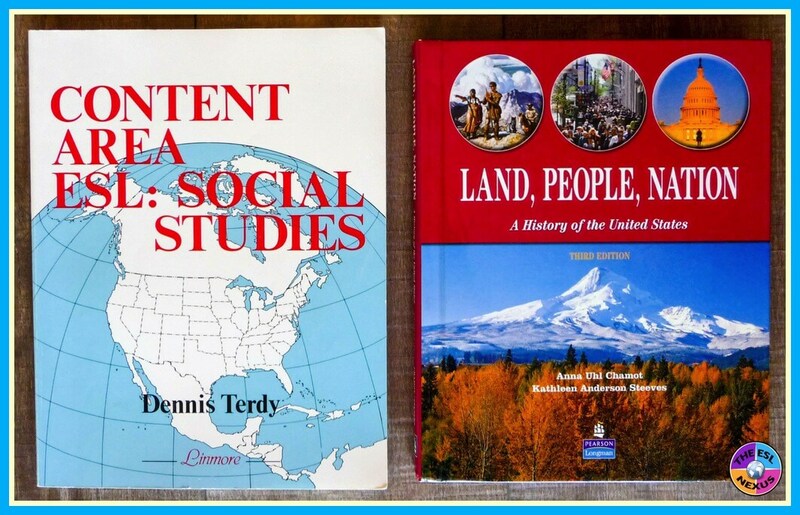 If you’re familiar with these books, you’ll know that they are great reference sources. Tons of full color pictures with paragraph-long captions, along with more detailed paragraphs about various topics related to the Revolutionary War. For high intermediate proficiency level ELLs, this book can be used to keep early finishers occupied and can also be used when doing research. 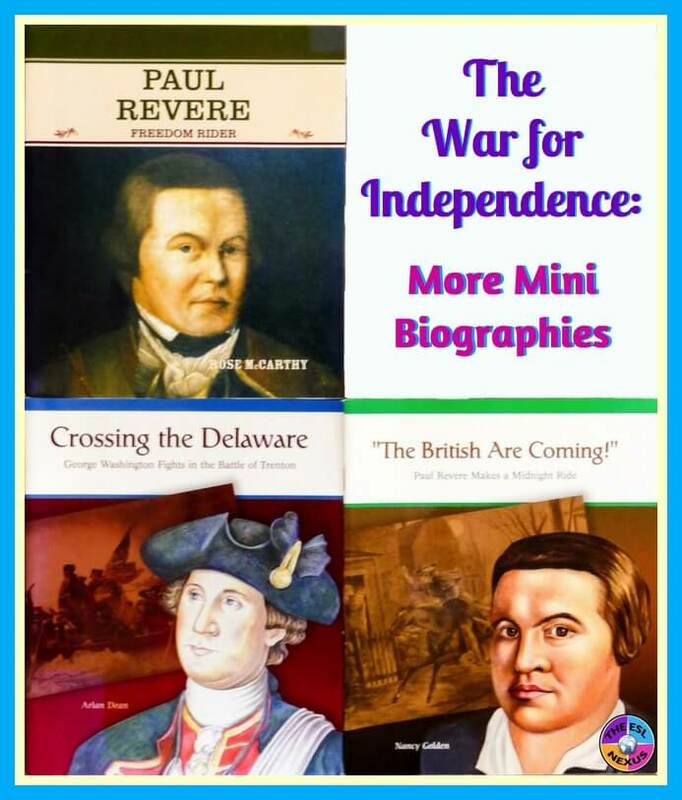 * Houghton Mifflin published a slew of short biographies of people involved in the War for Independence. They are leveled and ELLs at high beginning proficiency levels can comprehend some of them; all have lots of full color illustrations. Between 16 – 24 pages long, they have a few comprehension questions on the inside back cover along with an activity. If you can find them, they are great for having your students read them and then writing their own biographies; students can also create and give presentations about the persons. Click here for a link to the book about Joseph Brant. 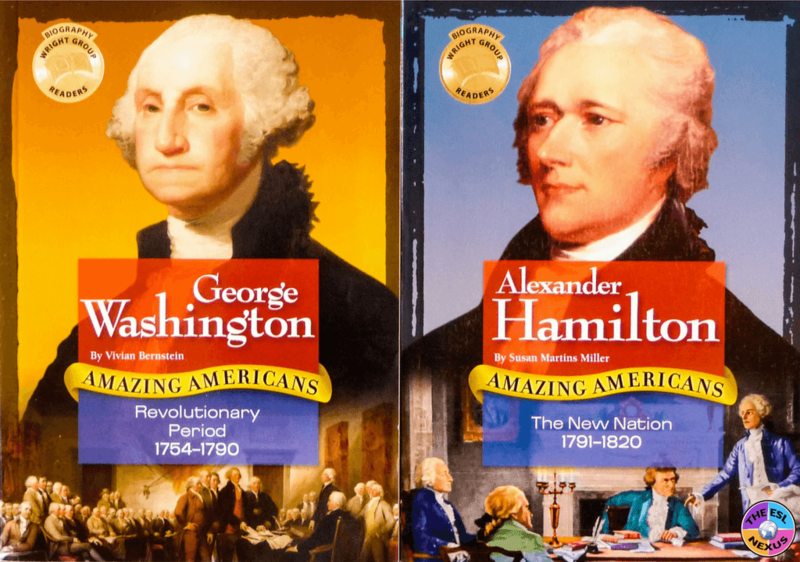 * McGraw Hill / The Wright Group also published a series of biographies called Amazing Americans. I have the ones about George Washington and Alexander Hamilton. These are longer (32 pages) and at a higher proficiency level (intermediate and up) but also have lots of full color pictures. Use these books in the same ways as above. 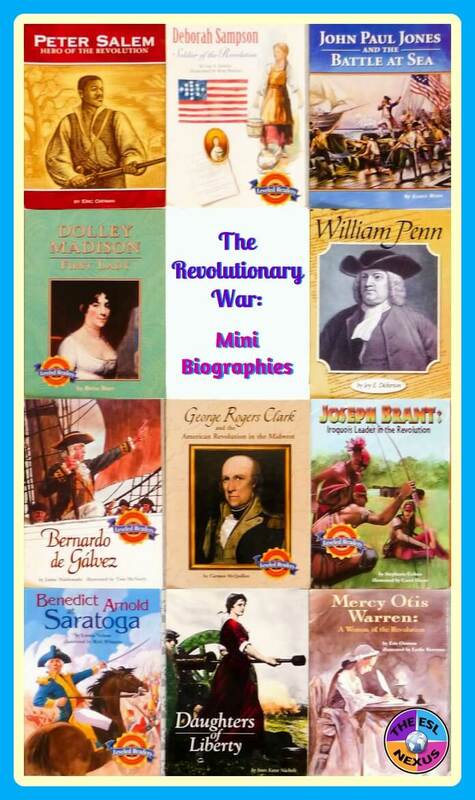 * Time for Kids has a biography of George Washington, by Dona Herweck. With more pictures than text, this is good for ELLS at a low intermediate level. At 24 pages, it includes a timeline of Washington’s life, a glossary, and “Important Vocabulary Words” at the end. This book is also available in a Kindle version (but I used the printed version). 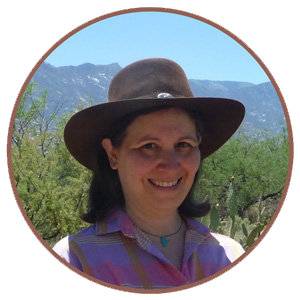 * Rosen Classroom / PrimarySource also publishes biographies. I have 3 in their series: 2 about Paul Revere (one is focused on his Midnight Ride and the other is more general) and another about George Washington crossing the Delaware River. These books are at an intermediate level, are all 32 pages long, and include full color illustrations and photos. They are also good for independent reading and creating presentations. * Rigby On Our Way to English published The Midnight Ride of Sybil Ludington. What’s nice about this 24-page book with lots of illustrations is that it comes in a 6-pack so you have more flexibility for using it when teaching about the Revolutionary War. I got it at an ESL conference and there was a 4-page teacher’s guide that came with it; I don’t know if that’s available when buying the book from the publisher’s website. You can use this book in the same ways as all the other books listed above. * U.S. Constitution by Teacher Created Materials, Inc.
Lots of activities to supplement your teaching. ELLs will need to be at an intermediate level of language proficiency or higher in order to do them. A book series with titles on The Presidency (the link is to this book), Congress, The Supreme Court, and Your Right to Vote. (Also includes Washington, D.C., and The White House but I don’t have those.) For high intermediate proficiency and up. Each book is only 48 pages and has lots of pictures. Useful for doing jigsaw reading and doing research. You might also consider reading portions aloud and discussing them with your students. This links to the first book listed below but links to the others are on the webpage. 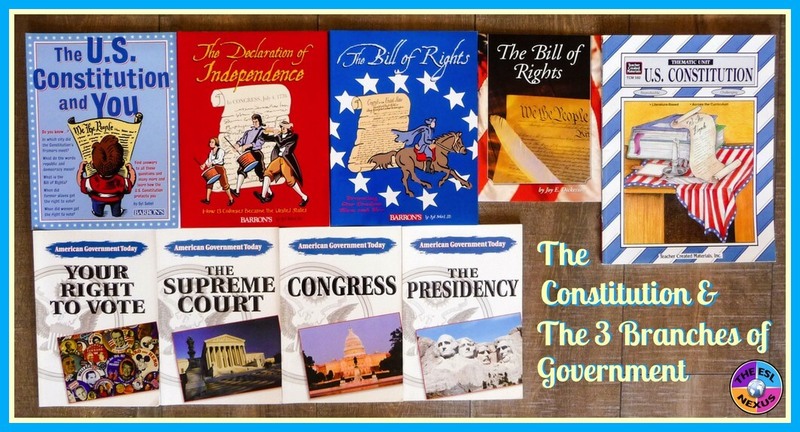 I have 3 of the books in this series, which is at a high intermediate proficiency level: The Declaration of Independence, The U.S. Constitution and You, and The Bill of Rights. Also included are How the U.S. Government Works, Presidential Elections but I don't have these two. Lots of drawings, though not in color; again, these books are good for jigsaw reading, doing research, and read alouds. This is a wonderful animated TV show that ran on PBS years ago. In the episodes I videotaped, there are segments comparing life in the Colonial period with modern life, a newscast that summarized the main ideas of the episode, and a game; these segments are not included in the videos that you can find online for free. There are 40 episodes in all but I didn’t show all of them. My 5th graders loved watching this show! This article from The New York Times gives some interesting background information about the song. I wrote 2 previous 4th of July posts; you can read them HERE.